The fifth annual symposium of the network was held in Uppsala on 5-7 October 2007. The program of the symposium can be found on the Nordic Symposiums page. A collection of papers from the first four Nordic symposia will be published by Brill in the series Studies in the Texts of the Desert of Judah by summer 2008. The book will be entitled Northern Lights on the Dead Sea Scrolls. International colleagues who have lectured at the symposia and contribute to the proceedings include George Brooke, Esther Eshel, Hanan Eshel, Daniel Falk, Jonathan Norton, Mladen Popovic, and Ian Werret. The proceedings further include papers by the following network members: Torleif Elgvin, Jesper Høgenhaven, Magnar Kartveit, Juhana Saukkonen, Håkan Ulfgard, Hanne von Weissenberg, and a joint paper by Jutta Jokiranta and Cecilia Wassen. To see the full titles of the contributions, click here. An academic text book that will appear in four Nordic languages for a joint university course in the spring of 2009 is under preparation. Many members of the network have been involved in the writing, and the editorial committee is working actively on editing and preparation of the book. The manuscript of the study book will be tested in a Qumran course at Aarhus University in the spring term of 2008. Magnus Riska was appointed external docent in Old Testament exegesis by Helsinki University in December 2007. Liv Ingeborg Lied successfully defended her dr.art. dissertation "The Other Lands of Israel: A Study of the Land Theme in 2 Baruch" at the University of Bergen on 7 Dec 2007. Torleif Elgvin and Jutta Jokiranta were among the invited speakers at an experts conference hosted by the University of Leuven on Qumran and the New Testament, 3-6 Dec 2007. Torleif Elgvin and Juhana Saukkonen were among the speakers at a conference on new approaches in Qumran studies hosted by University of Birmingham, 29 Oct?1 Nov 2007. Årstein Justnes successfully defended his dissertation "The Time of Salvation. An Analysis of 4Qapocryphon of Daniel (4Q246), 4Qmessianic Apocalypse (4Q521 2), and 4QTime of Righteousness (4Q215a" at MF Norwegian School of Theology, Oslo, on 30 Nov 2007. Prof. Martin G. Abegg (Trinity Western University) was the first opponent. Juhana Saukkonen is working on the publication of the Qumran stone vessels from Roland de Vaux's excavations, in co-operation with the Ãcole biblique et archÃŠologique. 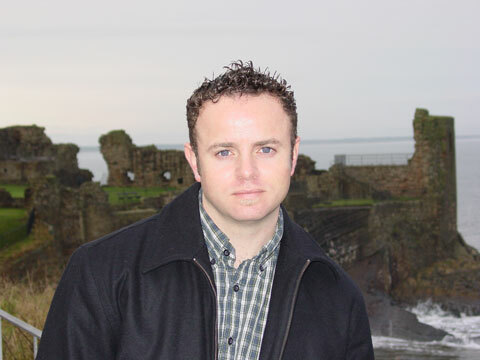 This is related to his post-doctoral research project, Religion at Qumran: Archaeological and Textual Perspectives. Juhana Saukkonen photographed in the basement of the Rockefeller Museum, together with a restored ceramic storage jar from Qumran. Torleif Elgvin gave an Orion Center lecture in Jerusalem on 17 April 2007, entitled "Seeing the Heavenly Temple: From the Hebrew Bible to Qumran." Following up an examination of the halakhic fragment 4Q472a Halakha C during the Jerusalem symposium in 2005, Ian Werret (pictured below) of St. Andrews University and Torleif Elgvin have been working on a new publication of this fragment based on recent infrared photographing. Torleif's readings in DJD 30 will be thoroughly revised. 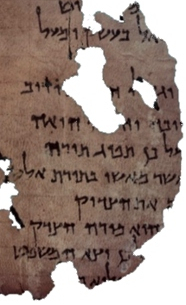 As this fragment was held to be the only Qumran fragment testifying to Essene habits of defecating, a better understanding of this fragment is vital for the ongoing debate. Their joint article appears in the forthcoming issue of Revue de Qumran. James Tabor and Joe Zias have recently released news on identified biological remnants from what they claim to be the Qumran latrine, 500 m north-west of the site. Gunnar Haaland succesfully defended his dissertation at the Norwegian School of Theology (Menighetsfakultetet) on 14 Dec 2006. The dissertation is entitled "Beyond Philosophy: Studies in Josephus and His Contra Apionem." in Vårt Land, 17 Oct 2006. For further discussion on the subject, go to www.qumran.no. Torleif Elgvin's annotated translation of early Jewish poetic texts appeared in a Danish translation in June 2006: Mine læber spiller fløjte: Jødiske bønner før Jesus (Credo Forlag). The Biblical Studies Section of the University of Copenhagen offered an introductory internet-based distance learning course in Qumran Scroll Studies, aimed at MA level students, in the spring term of 2006. The course was open to students worldwide and included an introduction to the major aspects of the field as well as close readings of the most important scrolls. Hanne von Weissenberg defended her doctoral dissertation on 28 April 2005 in Helsinki, with Prof. Florentino García Martínez (Katolieke Universiteit Leuven) acting as the Opponent and Prof. Raija Sollamo as the Custos. The title of von Weissenberg's dissertation is QMMT - The Problem of the Epilogue. Jutta Jokiranta defended her doctoral dissertation on 17 Dec 2005 in Helsinki, with Prof. Timothy Lim (University of Edinburgh) acting as the Opponent and Prof. Raija Sollamo as the Custos. The title of Jokiranta's dissertation is Identity on a Continuum: Constructing and Expressing Sectarian Social Identity in Qumran Serakhim and Pesharim. Cecilia Wassen's book Women in the Damascus Document has been published by Brill (hardback) and SBL (paperback); see the Publications page for full details. The fourth annual symposium of the network was held in Copenhagen on 25-27 August 2006. For the program of the symposium, see the Nordic Symposiums page. Juhana Saukkonen defended his PhD thesis in Helsinki on 28 May 2005. In this public examination, Professor George J. Brooke (University of Manchester) acted as the opponent and Professor Raija Sollamo as the Custos. The title of Saukkonen's thesis is The Story Behind the Text: Scriptural Interpretation in 4Q252. The Norwegian members of the network have completed their translation of the Qumran texts into Norwegian. The 400-page volume Dødehavsrullene was published in October 2004 in the series Verdens hellige skrifter by De norske Bokklubbene, Oslo. The volume will be widely published, as this series has more than 6000 subscribers. The publication of the volume received good coverage in Norwegian media. for participation in a seminar on The Jewish Bible - Delimitation and Use, at the University of Aarhus, 11-12 September 2007.
for participation in the conference Jews, Christians and Pagans in Antiquity - Critique and Apologetics, organized by the University of Aarhus, 22-26 January 2007.
for participation in the Nordic New Testament Conference in Helsingborg, 18-22 August 2007, where he gave a paper on Josephus' account of the Jewish constitution in Contra Apionem 2.163ff. for participation in the meeting of the International Organisation for Qumran Studies, Ljubljana, 16-18 July 2007.
for participation in the meetings of the International Organisation for the Study of the Old Testament and the International Organisation for Qumran Studies, Ljubljana, 16-20 July 2007.
for participation in the Enoch Seminar, Camaldoli-Arezzo-Ravenna, 8-12 July 2007.
for participation in the Annual Meeting of the Society of Biblical Literature, San Diego, 17-20 November 2007.
for participation in the meeting of the International Organisation for Qumran Studies in Ljubljana, 16-18 July 2007.
for participation in the International Meeting of the Society of Biblical Studies, Vienna, 22-26 July 2007.
for a study leave connected to the Orion Center of The Hebrew University of Jerusalem, March - May 2007.
for two research visits to the Ãcole bilique et archÃÅ ologique française, in March 2007 and August - September 2007.
for seminar and research visits to Helsinki. for a research visit to the Ãcole bilique et archÃÅ ologique française, Jerusalem August 2007.
to continue her post-doc research at the University of Manchester, January - February 2007.
for a seminar and research visit to Helsinki. to present some of the results from her Ph.D. research at a scholarly seminar guided by guest professor Edvard W. Soja at the University of Mancester, 6-7 Dec 2006.
for participation in the Annual Meeting of The Society of Biblical Literature in Washington, 18-21 Nov 2006, where she presented a paper on 4QMMT. for participation in the annual meetings of The American Schools of Oriental Research and The Society of Biblical Literature in Washington, 15-21 Nov 2006, and for a research visit at Ecole Biblique et Archeologique Francaise in Jerusalem in autumn 2006, where worked together with Père Jean-Baptiste Humbert on the publication of the excavation at Khirbet Qumran in the 1950s. This is related to his post-doc research project titled Religion at Qumran: Archaeological and Textual Perspectives. for participation in the International Josephus Colloquium in Haifa, 2-6 July 2006, where he presented a paper titled Convenient Fiction or Causal Factor? The Questioning of Jewish Antiquity According to C. Ap. 1.2.
for a research visit to the University of Göttingen, 28 June-5 July 2006, to further his research project on apocryphal psalms from Qumran in collaboration with Prof. Eileen Schuller, and participate in a conference in biblical studies in Göttingen, 29-30 June. for participation at the first Junior Enoch Seminar, Ann Arbor, Michigan, 2-4 May 2006. Hanne von Weissenberg gave a paper on Covenantal Motives in 4QMMT. to participate in the Society of Biblical Literature Annual Meeting in Philadelphia, 19-22 Nov 2005, where he (as steering member in this section) delivered a paper in the section on The Formation of Luke-Acts. He also worked with Hanne von Weissenberg and Anders Klostergaard Pedersen in the planning committee of the planned NNQS volume Qumran Within the Context of Second Temple Judaism. for a study visit to the University of Göttingen 1-13 Dec 2005, to further their research projects on hymnic material from Qumran in collaboration with prof. Eileen Schuller as well as German scholars. to participate in the tenth international symposium of the Orion Center for the Study of the Dead Sea Scrolls and Related Literature, at The Hebrew University of Jerusalem 9-11 January 2005. Elgvin presented a paper entitled The Use of Scripture in 1Q/4QMysteries. In addition, Elgvin used the occasion to prepare the Nordic symposium to be held in Jerusalem in September 2005. For a preliminary version of Elgvin's paper on 1Q/4QMysteries, . Based on a study of the original fragments in the Israel Museum, Elgvin will publish new transcriptions of the fragments of 4Q301 (4QMysteries c). for a study visit in Jerusalem 18-21 May 2005, for his project 'Geography and Ideology in the Copper Scroll'. Høgenhaven will study photographs of the scroll at the Rockefeller Museum as well as the Ãcole Biblique copy of the original scroll. for a study visit to Oslo in January 2005, to discuss readings of the manuscripts of 4QMMT with Torleif Elgvin, and to present a paper on MMT to the Norwegian group. for a study stay at the University of Manchester 4 March -1 April 2004, to compare 1. Peter with texts from Qumran. to participate in the congress of the International Organization for Qumran Studies in Groningen 26-28 July 2004. Jutta Jokiranta presented a paper titled Social Identity Approach: Identity-Constructing Elements in the Psalms Pesher. to participate in the Annual Meeting of the Society of Biblical Literature and the Annual Meeting of the American Schools for Oriental Research in San Antonio, Texas, on 17-23 November 2004. In the Qumran section of the SBL meeting, Saukkonen presented a paper titled From the Flood to the Messiah: Is 4Q252 a History Book? to participate in the Annual Meeting of the Society of Biblical Literature in San Antonio, Texas, on 20-23 November 2004.
to participate in the Nordic Congress for the Study of the New Testament in Stavanger, Norway on 14-18 June, 2003, and Society of Biblical Literature Annual Meeting in Atlanta, Georgia, on 22-25 November, 2003.
to attend The Context Group March Meeting in Philadelphia, USA, on 13-16 March, 2003.
to attend The Dead Sea Scrolls: An Academic Conference in Honor of Emanuel Tov in Grand Rapids, MI, USA, on 31.3.-2.4.2003.